Here are six mini-reviews of six films that I saw in 2016! In a word — BORING! Personally, I’ve always thought that, as a work of literature, Through The Looking Glass is actually superior to Alice’s Adventures in Wonderland. That’s largely because Through The Looking Glass is a lot darker than Wonderland and the satire is a lot more fierce. You wouldn’t know that from watching the latest film adaptation, though. Alice Through The Looking Glass doesn’t really seem to care much about the source material. Instead, it’s all about making money and if that means ignoring everything that made the story a classic and instead turning it into a rip-off of every other recent blockbuster, so be it. At times, I wondered if I was watching a film based on Lewis Carroll or a film based on Suicide Squad. Well, regardless, the whole enterprise is way too cynical to really enjoy. I don’t even know where to begin when it comes to describing the plot of Gods of Egypt. This was one of the most confusing films that I’ve ever seen but then again, I’m also not exactly an expert when it comes to Egyptian mythology. As far as I could tell, it was about Egyptian Gods fighting some sort of war with each other but I was never quite sure who was who or why they were fighting or anything else. My ADHD went crazy while I was watching Gods of Egypt. There were so much plot and so many superfluous distractions that I couldn’t really concentrate on what the Hell was actually going on. But you know what? With all that in mind, Gods of Egypt is still not as bad as you’ve heard. It’s a big and ludicrous film but ultimately, it’s so big and so ludicrous that it becomes oddly charming. Director Alex Proyas had a definite vision in mind when he made this film and that alone makes Gods of Egypt better than some of the other films that I’m reviewing in this post. Is Gods of Egypt so bad that its good? I wouldn’t necessarily say that. Instead, I would say that it’s so ludicrous that it’s unexpectedly watchable. Bleh. Who cares? I mean, I hate to put it like that but The Huntsman: Winter’s War felt pretty much like every other wannabe blockbuster that was released in April of last year. Big battles, big cast, big visuals, big production but the movie itself was way too predictable to be interesting. Did we really need a follow-up to Snow White and The Huntsman? Judging by this film, we did not. Me Before You was assisted suicide propaganda, disguised as a Nicolas Sparks-style love story. Emilia Clarke is hired to serve as a caregiver to a paralyzed and bitter former banker played by Sam Claflin. At first they hate each other but then they love each other but it may be too late because Claflin is determined to end his life in Switzerland. Trying to change his mind, Clarke tries to prove to him that it’s a big beautiful world out there. Claflin appreciates the effort but it turns out that he really, really wants to die. It helps, of course, that Switzerland is a really beautiful and romantic country. I mean, if you’re going to end your life, Switzerland is the place to do it. Take that, Sea of Trees. Anyway, Me Before You makes its points with all the subtlety and nuance of a sledge-hammer that’s been borrowed from the Final Exit Network. It doesn’t help that Clarke and Claflin have next to no chemistry. Even without all the propaganda, Me Before You would have been forgettable. The propaganda just pushes the movie over the line that separates mediocre from terrible. Y’know, the only reason that I’ve put off writing about how much I hated this film is because Garry Marshall died shortly after it was released and I read so many tweets and interviews from people talking about what a nice and sincere guy he was that I actually started to feel guilty for hating his final movie. But seriously, Mother’s Day was really bad. This was the third of Marshall’s holiday films. All three of them were ensemble pieces that ascribed a ludicrous amount of importance to one particular holiday. None of them were any good, largely because they all felt like cynical cash-ins. If you didn’t see Valentine’s Day, you hated love. If you didn’t see New Year’s Eve, you didn’t care about the future of the world. And if you didn’t see Mother’s Day … well, let’s just not go there, okay? Mother’s Day takes place in Atlanta and it deals with a group of people who are all either mothers or dealing with a mother. The ensemble is made up of familiar faces — Jennifer Aniston, Julia Roberts, Kate Hudson, and others! — but nobody really seems to be making much of an effort to act. Instead, they simple show up, recite a few lines in whatever their trademark style may be, and then cash their paycheck. The whole thing feels so incredibly manipulative and shallow and fake that it leaves you wondering if maybe all future holidays should be canceled. I know Garry Marshall was a great guy but seriously, Mother’s Day is just the worst. As far as recent Biblical films go, Risen is not that bad. It takes place shortly after the Crucifixion and stars Joseph Fiennes as a Roman centurion who is assigned to discover why the body of Jesus has disappeared from its tomb. You can probably guess what happens next. The film may be a little bit heavy-handed but the Roman Empire is convincingly recreated, Joseph Fiennes gives a pretty good performance, and Kevin Reynolds keeps the action moving quickly. As a faith-based film that never becomes preachy, Risen is far superior to something like God’s Not Dead 2. It would be disingenuous of me to not start this review by saying that I went into ‘Interstellar’ with a clear and present bias. Not towards Nolan – though I think he is a wonderful director who has not yet made a truly bad film. But a bias towards the scientific theories and potential themes I expected – based on trailers and the concept of the film – that it would explore. I have always been very interested in astronomy and astrophysics – and have a soft spot for science fiction films with a strong emotional core (‘Close Encounters of the Third Kind’, ‘Contact’). So when I headed to the theater I knew I was walking a very fine line (one that many reviewers walk but won’t admit to). If the film met (even marginally) my high expectations then it would in no doubt lead to high praise that bordered on hyperbole – and if it didn’t – if it disappointed – then it would cause a reaction a lot more negative than it really needed to be. 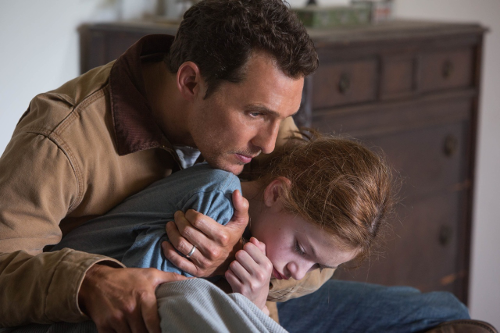 Where did ‘Interstellar’ ultimately fall? Hyperbole…or disappointment? Well luckily for me it was the former…to a fairly strong degree. I’ll say it now – this is not just probably my favorite film of the year so far, but like with ‘Gravity’ and ‘The Tree of Life’ (yes, more on that later) in recent years, this may fall within my favorite films of all time. It is a dazzling, visually stunning, emotionally resonant and incredibly well made sci-fi space epic – one with the power to keep you on the edge of your seat one minute and in tears the next. It explores big ideas about the cosmos while also staying incredibly grounding with an intimate story about family, regret, sacrifice and love. Like I said…hyperbole. The film takes place in a not so distant future in which the world is becoming unlivable. After population growth, climate shifts and diseases ravishing crops, the world is struggling to produce enough of what little food sources they have left – which means a heavy reliance on corn farms. It is very bleak future where dust from dust storms covers everything, and the only focus of mankind is struggling to survive with what they know and have. Innovation, free thinking and exploration are at a standstill – and unless schools deem you smart enough to go on to a university, your only career prospective is farming. Matthew McConaughey stars as Cooper, a widower and former pilot who now owns a farm where he lives with his two young children. He does his best to provide for his family but clearly wants more for them than what the current world can provide. After finding a mysterious message in his daughter Murph’s room, Cooper finds himself being recruited by what is left of NASA. They are secretly putting together a mission to journey through a wormhole that has appeared near Saturn. They do not know how it got there but they do know that beyond it is a solar system with some potentially habitable planets. They want Cooper to pilot an expedition through the wormhole to explore these planets and see if one is suitable to set up a new human colony. Cooper reluctantly agrees, even though it means leaving his children behind. He knows that the journey could kill him or – due to the laws of relatively – that by the time he does return his children may be much older than he is or already dead. But the fate of the human race – including his son and daughter – relies on finding a new home. So he sets out with a team of astronauts – and one pretty funny robot – on a journey that will take them farther than any humans have ever gone. The decision devastates his young daughter Murph – who he had a close relationship with – and it sets her out on a journey of her own to save humanity in a way she believes her father couldn’t. To go into much more detail of the plot would ruin much of the experience. But I will say it becomes a fast paced and exciting journey. It does sometimes fall back on the usual genre tropes but there is never a dull moment; and it all builds up to an emotional and rewarding conclusion. The performances are truly superb. For all his technical mastery, Nolan is also an actors’ director and he gets the most out of his casts. 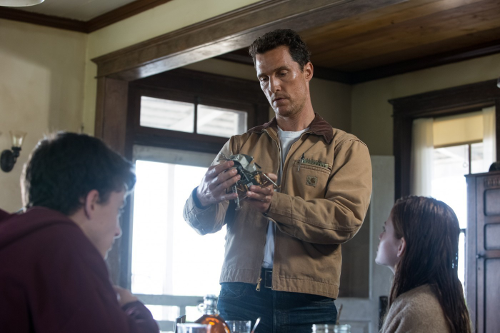 McConaughey is at his best here – which is saying a lot considering his work in recent years. The emotion he brings is on a whole different level than anything he has done before. Jessica Chastain, who plays the adult Murph, also has a strong presence. Both actors wear the burden of their decisions and regrets on their shoulders, and you can see it in every scene. They are the heart and soul of the film. Hathaway also did a wonderful job – as did Wes Bently, Michael Caine, and David Gyasi. The score from Hans Zimmer is loud and heart pounding. He always manages to perfectly convey the intensity of some truly exciting set pieces – while also slowing down to capture the emotions of the more intimate moments, and this score is no different. The visuals are absolutely stunning. The effects (most of them created through practical means) were influenced by physicist Kip Throne – who also oversaw a lot of the science in the film – and the result is dream-worthy space imagery. Interestingly, the depictions of the wormhole and black hole in ‘Interstellar’ are considered to be the most accurate ever created. The results are gorgeous, especially on a big screen – with one scene with Saturn making me all teary eyed. Below the spectacle and hard science is an emotionally resonant tale of exploration and human ambition that puts its faith not only in science but also the human soul. Does it become heavy handed at times? Of course! This is a space opera – a science fiction epic – with a big budget, big ideas, big name actors, big visuals and so the emotions at times match that. The first 40 minutes or so do a fantastic job setting up the bond between Cooper and his daughter. It is a wonderful relationship – but a complex one filled with love, anger and regret. It is also the backbone of the story and Nolan builds the emotion from there. Like with ‘The Tree of Life’ (I told you I was going here), the juxtaposition of dazzling space images and the exploration of the cosmos with this grounded and intimate family story about love and nature make for a challenging but truly rewarding experience. One that asks big questions about our relationship with each other and the universe we inhabit; and examines how the flow and clash of such things as love and instinct with nature can change and inspire us for better or worse. Nolan does seem to want to show how love has the ability to conquer and transcend even the harshest things nature and its laws can throw at us. 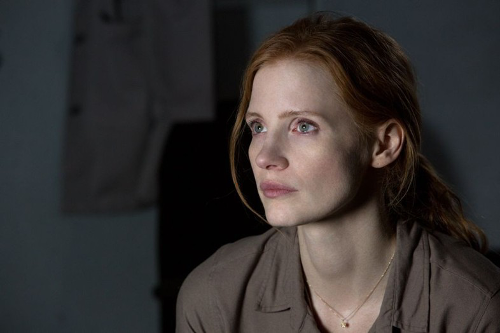 It is almost fitting then that Chastain stars in each, and has a roll in both stories that could be almost viewed as similar – as the focal point of love that guides the main character and the audience. 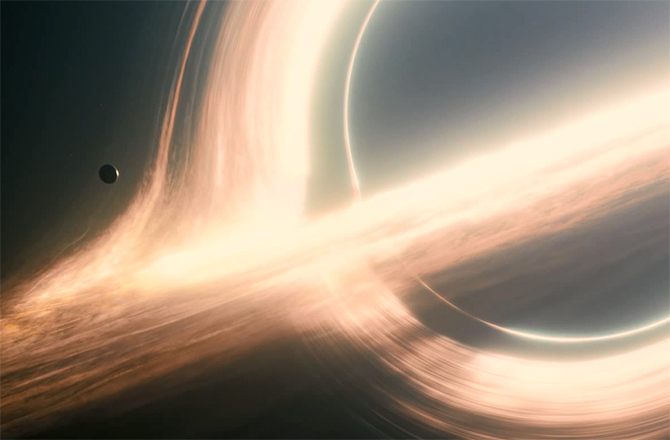 And like with ‘The Tree of Life’ I can totally understand why people would not like ‘Interstellar’. Neither are films for everyone. 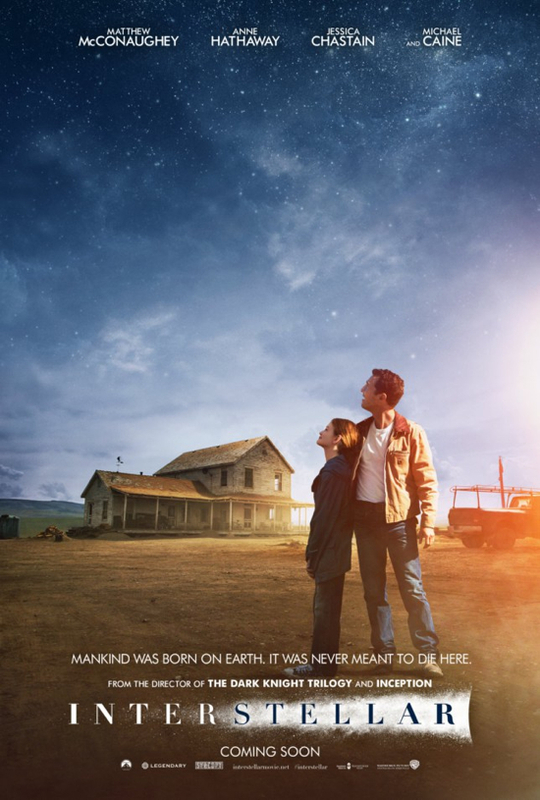 I believe most reviews I have seen are so mixed because ultimately ‘Interstellar’ relies so heavily on the emotions at the core of the story that it was inevitable that it wouldn’t connect with some people. You have to be open to some extreme sentimentalism, which just isn’t the case for everybody. I won’t go into much detail over the film’s final act, but I think it makes perfect sense within the logical and emotional progression of the story – though some critics disagree. They seem to think that Nolan’s often straight forward hard science approach is too stern and takes the wonder and ambiguity out of his stories and I found that to not be the case with ‘Interstellar’. Mainly because the ending does in fact have some level of ambiguity – but what it does explain adds a level of wonder and hope that would be lost had it been open ended. I will also say that I find it absolutely absurd that some critics who praise and accept the ending to’2001: A Space Odyssey’ have dismissed this one for being too convoluted or even nonsensical…as if those couldn’t also be said of the ending of Kubrick’s film. But again maybe this is all just me. As I warned you, hyperbole was expected and I think this review lived up to that. I truly loved the film. It generated in me the same feeling of wonder, excitement and curiosity I got from the spectacle and emotions of ‘Close Encounters of the Third Kind’ and ‘Contact’ –the realism of ‘Gravity’ – and the complexity and mind bending theories of ‘2001: A Space Odyssey’. Throw in with that the connections I felt it had with such films as ‘The Tree of Life’ and there was no way I wasn’t going to love it. This is cinema at its finest. Whatever flaws it might have I can easily overlook due to not only how moving and entertaining of an experience it all is – but also because it is just so damn ambitious. Whether you see it on a large IMAX screen or not, you’ll be moved in one way or another. Now, I don’t usually do this but I would like to end by quickly addressing the small group of people who have been crying sexism before the film even got its wide release. Apparently, because the lead is a scruffy male and the film is about the will power of mankind to journey off and explore the unknown, that it is somehow a male centric film that is about masculinity above all else. If the idea of human endeavor, innovation, the struggle to survive, and the pursuit of knowledge brings to your mind nothing but masculinity and male dominance then blame society – not the film – because it was clearly not its intentions and really is just not even remotely the case here. You could easily replace McConaughey’s character with a female lead (like in ‘Contact’) and the narrative, emotional and thematic results would be EXACTLY the same. This all seems even more ridiculous given the fact that the female characters play a much more important role than any of the men. Their work, decisions and perspective essentially save the day. It isn’t until the men view the situations and universe through them that they are able to succeed. I have also been thrown off by the complaints of Nolan’s reliance on “daddy issues” or the “dead wife/spouse” tropes, and fail to see how these (which I admit are often present in his films) should at all matter when they fit so well into the story and are so emotionally effective. Not to mention Cooper being a widower has nothing to do with any decision he makes; and the relationship Murph has with him is far more complex than simply being “daddy issues”. It is actually a wonderfully realized one, with Nolan drawing experience from the relationship he has with his own daughter. But why are these even being brought up by people, so early and with such vigor? Do not get me wrong, I understand and appreciate the opinions of those who simply did not like it…but for the few who have criticized it for the aforementioned reasons I just cannot wrap my head around where they are coming from. Sexism is often an issue in cinema and film making as a whole and something that could clearly be worked on…but it just does not apply to ‘Interstellar’ in any way. And I say this as someone who isn’t a Nolan fan boy. Yes, I appreciate his work – he has made some truly great films – but I am not one of those who think he is the best director working right now. But it is hard to not be disappointed and confused by the fact that every time he releases a film there are tons of articles that pop up to critique what would otherwise be completely ignored in other films – or in some case they critique things they didn’t even care about in his other films. Maybe this is just the price a director like him faces. His work tends to be so popular that critics seem to try extra hard to make their voices heard – an attempt to quell the masses of fans excited to see it – by overreaching in their criticism. This is made all the more disheartening when you consider he is one of a very few filmmakers willing to take such big risks to make smart and ambitious films. But maybe I am wrong. Please, let me know your thoughts! Now, I have to admit that it’s rare that her and I ever agree on anything. For instance, she thinks that Barack Obama is going to save the world whereas I … well, let’s just say that I don’t. She watches Glee and I would watch Community if it would ever come back on the air. However, we do usually agree about films and, in fact, our friendship was initially the result of our shared loathing for Avatar. So, I was curious why her reaction to Les Miserables was so different from mine. In her own words, Les Miserables was “bombastic” and over-directed by Tom Hooper. She complained about Russell Crowe’s singing and she felt that Sacha Baron Cohen appeared to be acting in a totally different film from everyone else. The term “style over substance” came up more than a few times and she felt that even the things that did work — like Anne Hathaway’s draining performance as Fantine, Samantha Barks’ poignant work as Eponine, and Aaron Tveit’s charismatic performance as Enjorlas — simply served to highlight how uneven the film was when taken as a whole. Finally — and I think that this is actually the key behind a lot of the online backlash against Les Miserables — she admitted that a part of her reaction was due to the fact that she still resented the fact that Hooper’s previous film, The King’s Speech, defeated The Social Network for Best Picture way back in 2010. What’s ironic is that I found myself agreeing with a lot of what she was saying. The fact of the matter is that Hooper does over-direct Les Miserables and the frequent jump cuts do tend to detract from the film’s performances. It’s not a coincidence that the film’s best performance is given by one of the few performers (Anna Hathaway, of course) who is actually allowed to sing an entire song in close-up without Hooper cutting away to distract us with something else. And yes, Sacha Baron Cohen does feel out-of-place and yes, Russell Crowe is a bit miscast in the role of Javert. And yet, despite those not minor complaints, I still loved Les Miserables and I think it’s more than deserving of its nomination for Best Picture of the year. Les Miserables in an adaptation of the Broadway musical that was itself an adaptation of Victor Hugo’s classic novel. The plot will be familiar to anyone who has ever taken an English class. In 19th century France, Jean Valjean (Hugh Jackman) serves 19 years in prison for stealing bread. When he’s paroled from prison, he adopts a new identity and starts a new life. Eventually, he becomes a factory owner and a local politician and is known for his kindness and honesty. When the tragic prostitute Fantine (Anne Hathaway) dies, Valjean adopts her daughter, Cosette. However, when the obsessive Inspector Javert (Russell Crowe) learns of Valjean’s true identity, Valjean and Cosette are forced to go into hiding. Many years later, the now grown Cosette (Amanda Seyfried) has fallen in love with the revolutionary Marius (Eddie Redmayne, who gives a performance that is just as good as Hathaway’s much more lauded work). As France descends into revolution, Javert again discovers Valjean, much blood is shed on the streets of Paris, and Sacha Baron Cohen keeps popping up and offering some awkward comedic relief. Yes, Les Miserables is all about style and yes, it is a bit bombastic but is that necessarily a bad thing? I loved Les Mis specifically because it was such an old school spectacle. There have been several very serious, very sober-minded adaptations of Les Miserables and most of them, especially the nearly 5 hour French version from 1934, deserve to be seen. Both the Broadway musical and Hooper’s adaptation play up the story’s inherent melodrama and the resulting show is one that is designed to get more of an emotional response than an intellectual one. Tom Hooper’s Les Miserables is a film that has specifically been made for those of us who aren’t ashamed to shed a few tears at the movies. When I walked out of the theater after watching Les Miserables, I had mascara everywhere and I can’t think of a higher compliment to pay this uneven but ultimately triumphant film.